Smasher goes shopping for a wedding dress with Gertie Funt and several of her S.O.S. teammates but cannot choose a dress. 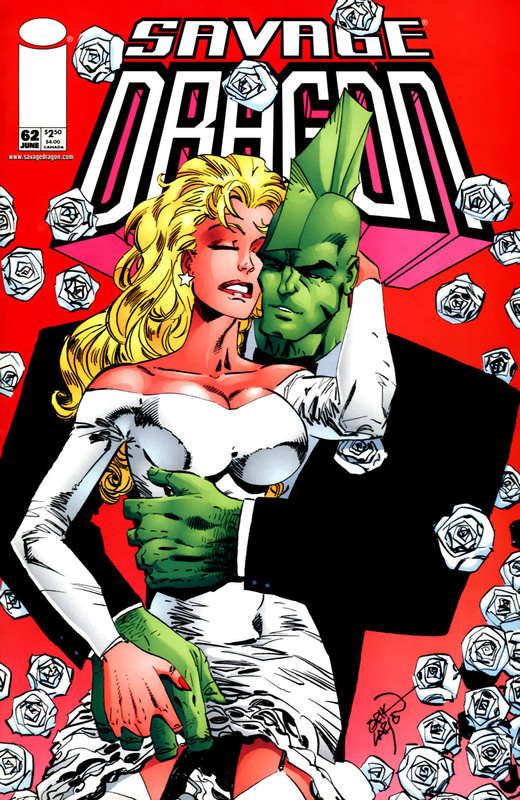 Ricochet suggests that she simply wears the dress she wore for her first marriage but it reminds Smasher too much of that previous abusive relationship. Smasher opts to get changed and go for lunch before returning to make her decision. As she reaches the changing room, Smasher is shocked to find Imposter waiting for her. He knocks Smasher out with some gas before taking on her appearance and rejoining his victim’s friends. Dragon gets ready for the wedding which is a relatively small affair that will be taking place in his garden. Frank Darling is best man and checks up on his friend to make sure that he is not too nervous about the day. Alex Wilde then drops by to give her encouragement, telling Dragon that he should get moving before she drags him off to Las Vegas to marry her instead. The wedding ceremony takes place and as Dragon and Smasher are made husband and wife they are given permission to kiss. This never happens though as OverLord blasts down out of the sky and shoots Smasher through the torso, cutting her in half. He then moves towards Angel Murphy as SuperPatriot tries to intercept. An enraged Dragon reaches OverLord first and relentlessly pummels his nemesis in an attempt to avenge his new wife’s murder. OverLord explains how Dragon may have killed him but his brainwaves had been saved so that his memories could be downloaded into his armor. He had no soul of his own so OverLord has been relying on others to occupy the armor. OverLord desires payback over having his life taken from him by eliminating everything that Dragon holds dear until he finally kills him too. Their fight moves into the house before OverLord blasts out and flees, Dragon vowing to find and kill him. Dragon and Angel then hold one another and mourn the death of Smasher. A funeral service is soon held for the murdered Smasher where her aunt and uncle approach Angel and ask her if she would like to come and live with them. Angel replies that she wants to live with her new father and Dragon then informs them that their grand-niece is taken care of. The elderly couple leave but state that they will talk at a later time. Dragon is then comforted by Alex, Ann Stevens and Rita Jonson before Dragon informs Frank that he wants to find OverLord and make him pay for his actions. Dragon attends a secret meeting with PowerHouse where they discuss the possibility of who is beneath the OverLord armor. They confirm that CyberFace’s attempts to download his mind into the battle-suit had failed but Antonio Seghetti succeeded where his rival had failed. PowerHouse suspects that either a police officer or a Vicious Circle member or even some homeless person took the OverLord armor but cannot give a definite answer. He also suspects that this host is serving as a conscience to OverLord and is directing his actions somewhat. OverLord defends his actions against Smasher to Mace, stating that he killed her for him. OverLord lies by saying how Super-Tough has not been in a year or so because Dragon murdered him and he had merely been claiming revenge on behalf of Mace. He declares that if someone hurts one of the Vicious Circle then they will hurt them back. Mace is unaware that deep within OverLord’s headquarters, a chained man calls out for Mace not to believe these words. Dragon has moved out of the family home while repairs are made and is now raising Angel on his own. They are visited by Alex who has come to check on their progress and make them a home cooked meal. She is informed by Dragon that he has quit the S.O.S. as he cannot risk being away from Angel for too long and can still fight crime as a bounty hunter if he desires. Meanwhile, the real Smasher is being stored in a stasis pod by the Covenant of the Sword. Imposter had been assigned to abduct Dragon for them but failed in that task but he did capture Smasher instead who is a superior physical specimen. She will join Dragon’s son as part of Master Scourge’s organisation and become a valuable addition to the Covenant of the Sword.